From New York Times bestselling author, Joe Abercrombie, comes a collection of award-winning short fiction set in the world of the First Law. The Union army may be full of bastards, but there&apos;s only one who thinks he can save the day single-handed when the Gurkish come calling: the incomparable Colonel Sand dan Glokta. And after years of bloodshed, the idealistic chieftain Bethod is desperate to bring peace to the North. There&apos;s only one obstacle left - his own lunatic champion, the most feared man in the North: the Bloody-Nine . 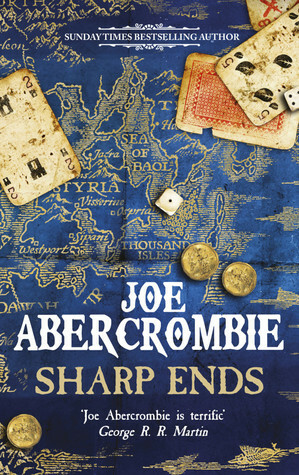 . .
Sharp Ends combines previously published, award-winning tales with exclusive new short stories. Violence explodes, treachery abounds, and the words are as deadly as the weapons in this rogue&apos;s gallery of side-shows, back-stories, and sharp endings from the world of the First Law. Lunco (Grade: A) Made me want to reread the first trilogies. SniffaCat (Grade: A) A great set of short stories set in the First Law World. Although in theory, you could read this as a stand alone book, it's much better to read after the other books in the series as many of them act as a back story to the original characters.